Obviously a big brother to the 2019 P30, the Huawei P30 Pro swaggers around the flagship category with an ultra-high-end (as of this review) Leica Quad Camera in its arsenal. It consists of a high-resolution 40-megapixel main lens, a 20-megapixel ultra-wide-angle lens for scenic shots, an 8-megapixel periscope camera that enables up to 10x hybrid zooming (SuperZoom Lens), and a TOF (Time-of-Flight) camera that's dedicated to 3D imaging. Together, the aforementioned cams give it a solid chance at a spot on Phonerated's list of the best smartphones for photography and videography. That promising pro aside, however, the P30 Pro still suffers from a couple of cons, one of which is its decision to stick to a 2340 x 1080 FHD+ screen resolution for its 6.47-inch OLED display -- most of the best phablets in town boast 2K-1440p display resolutions. Moreover, its 192g body weight makes it sound rather bulky compared to some of its flagship-class rivals, which weigh only roughly 160 grams. 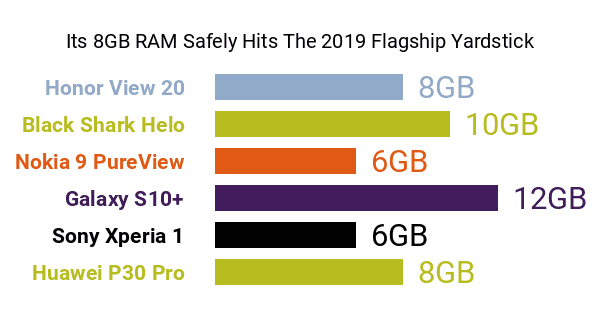 Among the P30 Pro's other pros and cons is a triple-cluster Kirin 980 octa-core processor whose main cluster peaks at 2.6GHz, with two distinct neural network processing units (NPUs), which tailor it to mobile AI applications, in the mix as well. It is accompanied by a large 8GB RAM and a 512GB maximum internal memory (Huawei also ships 256GB and 128GB versions). 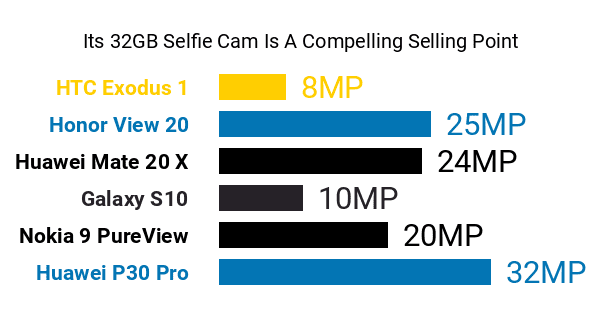 As for selfies, the P30 Pro brings back its base model's 32-megapixel f/2.0 front-facing camera , which possibly plugs it into our list of the best phones for selfies. Also, like a few competing models with comparable specs, it is powered by a 4200mAh battery that's enabled for both wired (Huawei SuperCharge) and wireless charging. Adding to its upmarket pros and cons are an in-screen fingerprint reader and an IP68-rated housing, the latter making it impervious to dust grains and water. It is topped off by a 3D curved glass physique that's finished in colors like Amber Sunrise and Breathing Crystal. To rehash, Huawei's P30 Pro calls out to tech-savvy users who are heavily inclined to mobile photography and gaming.